Patachitra is a unique folk tradition of visual storytelling accompanied by songs performed by the Patuas. The painters are called Patua and bear the surname – Chitrakar. 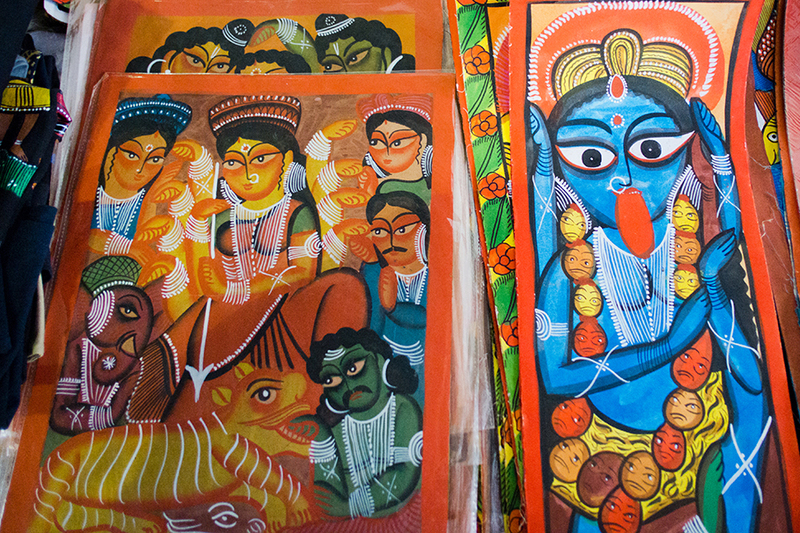 The paintings describe stories based on mythology or social, historical and contemporary issues. The Patuas compose songs on the stories then paint to corroborate with the story, which they unfurl and sing. This makes the Patuas lyricists, painters, singers, all blended into one. Bright and bold colours and simple tunes are their specialty. Naya village of Pingla in Paschim Medinipur district is the largest hub of Patuas with 60 families carrying on with the tradition. 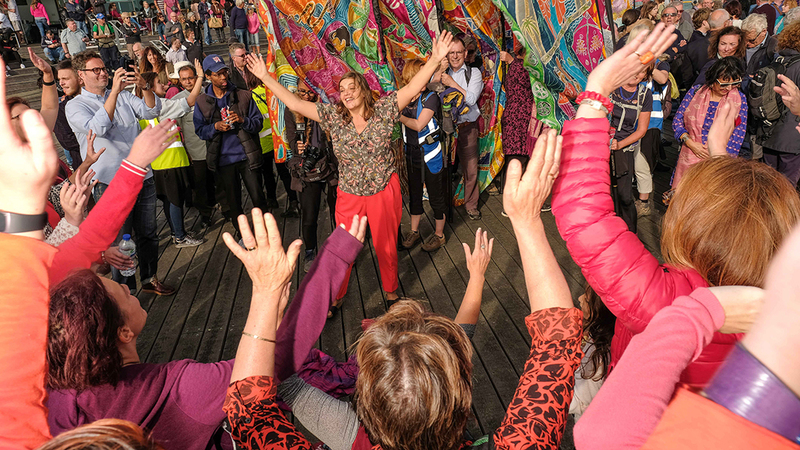 The tradition of of Patachitra has had a large influence on the Silk River Project, both as a form of visual storytelling and artist exchange. 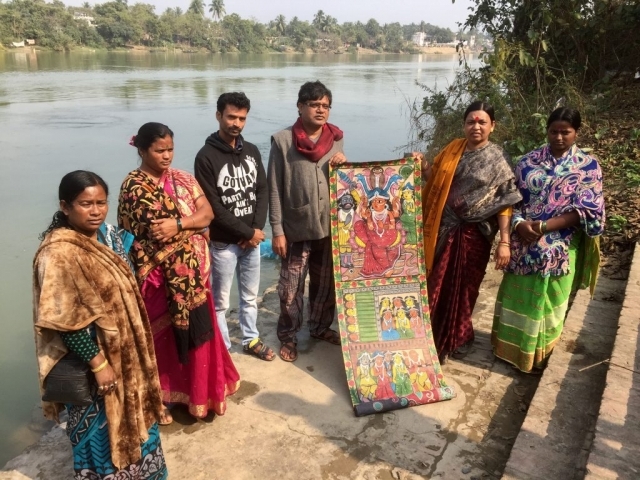 Guided by the Rural Craft and Cultural Hubs in the region, Ali Pretty met numerous patua artists on a research trip to the area, including Swarna and Mano Chitraker. 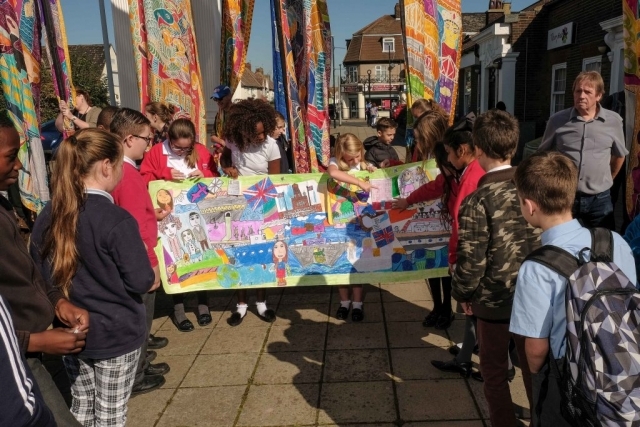 What better way to tell the story of the two might rivers Thames and Hooghly, by creating giant scrolls made of locally sourced silk? And so the artist exchange began. 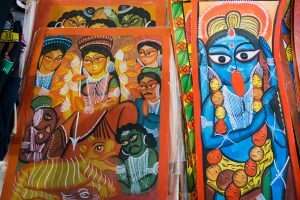 In January 2017 artists from the UK went to West Bengal to work with local artists there and together they created the Indian Scrolls. In February 4-12, both of these Patua artists travelled to the UK and conducted numerous workshops with communities along the Thames, which generated lots of ideas and designs. 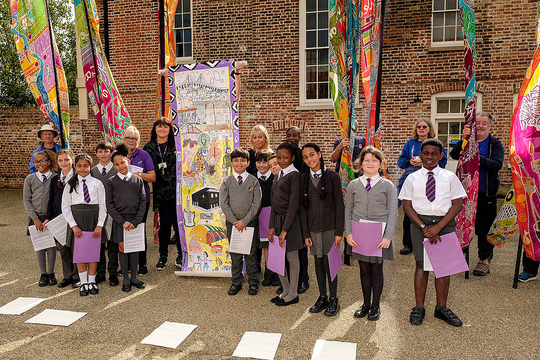 Working with Ali Pretty, Jacci Todd and Jane Ford, local artists then made those designs into the UK Scrolls, and schools created detailed paper versions to tell their own story. The wonderful thing about patachitra is its multi-stranded approach to storytelling – these are not just beautiful pictures, they are traditionally viewed accompanied by song. 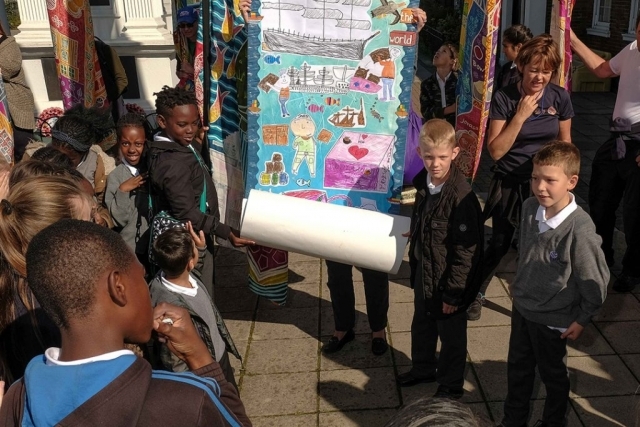 All the communities along the rivers had different approaches to how this was interpreted in their vision, how they wanted to tell their story. Some wrote poems, some brought live bands, there was even a re-enactment of a protest march and yes, even some songs too. Film above by Mike Eden from RouteStock. 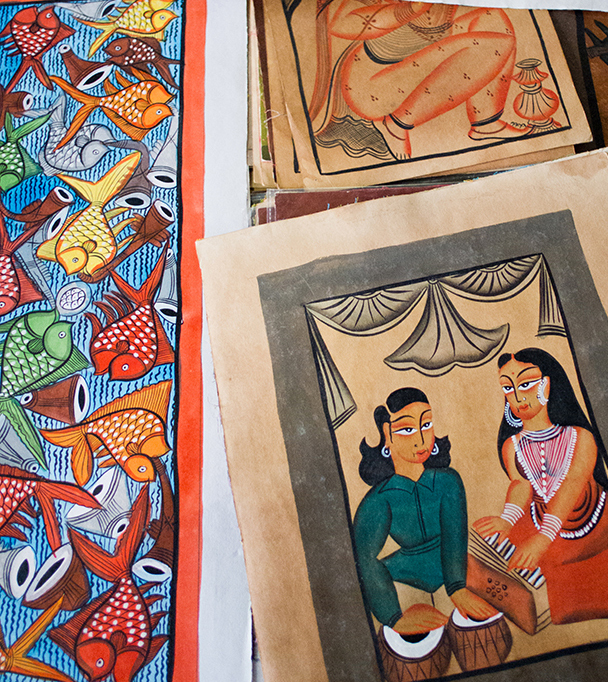 Rupban Chitrakar, Swarna to most people, took to painting as a child by observing her father. She paints on a diverse range of mediums like cloth, clay and ceramic. The changing times have also been deftly captured by her. Improvising from traditional stories, she depicts the Tsunami and terrorist attacks of 9/11 in her art along with other social themes like child marriage, child trafficking, etc. 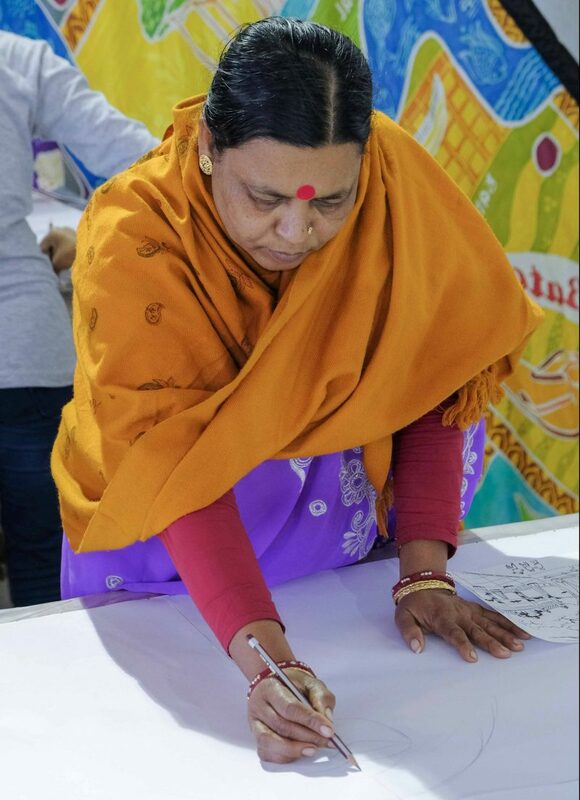 She specialises in painting on women empowerment issues. Swarna is one of the most noted Patuas of present times and is an iconic figure for the women of Pinlga and a constant source of inspiration for the young girls. She has participated at major festivals in France, Germany, Australia, USA, Sweden, China, UK, and all over India to showcase her creations. 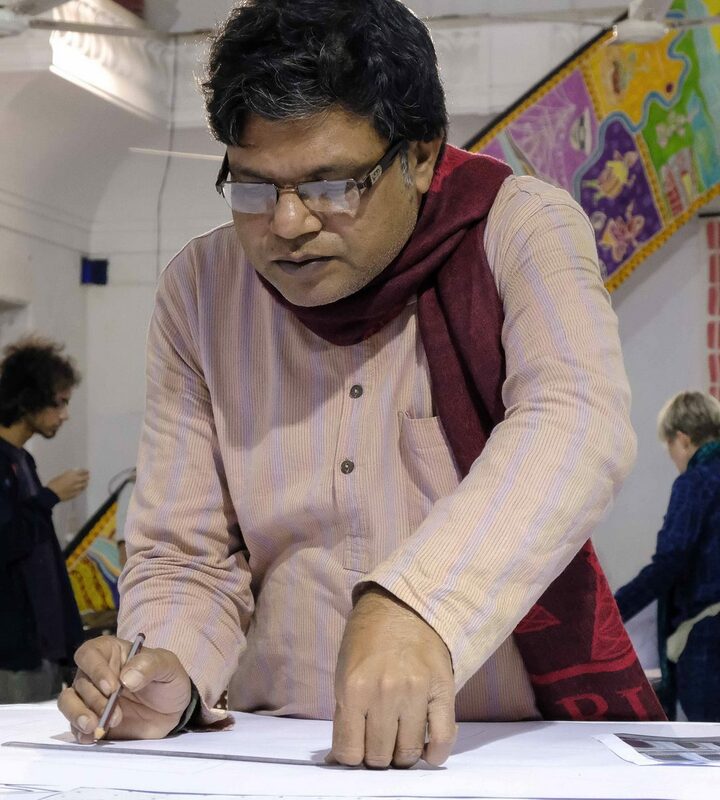 Manoranjan Chitrakar, has been painting since the age of 15. He loves to address social issues through his works. Manoranjan has travelled all across India and to Sweden and France. He visited the UK with the Silk River project in Feb 2017. 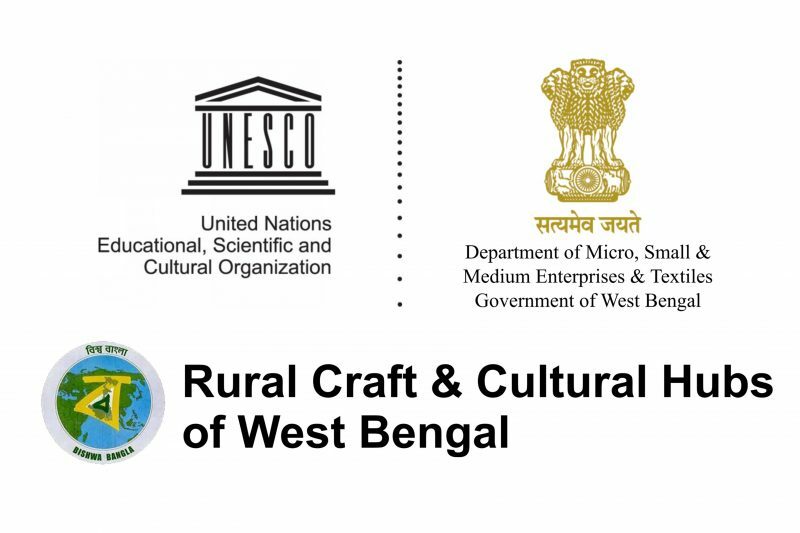 The Government of West Bengal and UNESCO have taken up a unique Rural Craft & Cultural Hubs project to capitalize the cultural assets aimed at developing creative enterprises at the grassroots. The project covering 15000 people involved with about 35 traditional art & crafts is being implemented by social enterprise banglanatak dot com. The RCCH project has joined hands with the Silk River Project. 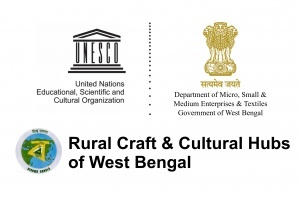 Artists from the Patachitra, Clay Doll and Kantha Hubs are participating in the project. 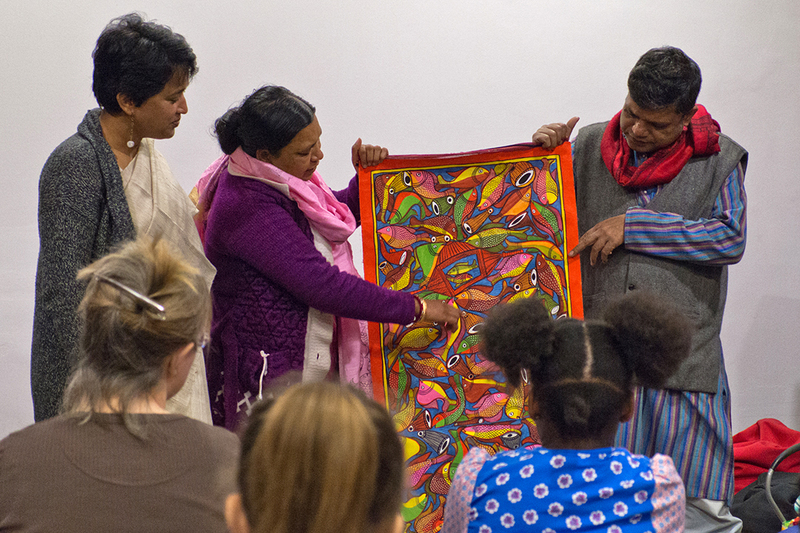 Two of the leading Patachitra artists from Pingla, Rupban and Manoranjan Chitrakar visited the UK from February 4-12, 2017 as part of the Silk River project.